Tarantulas are among the largest spiders in the world and likely the most feared. Emergency physicians are increasingly likely to encounter patients who have had tarantula contact as the popularity of tarantulas as pets is increasing. Tarantulas belong to the suborder Orthognatha and the family Theraphosidae. These large (2.5-7.5 cm) arachnids are slow moving. Females can live as long as 35 years, while the male life span is generally 5-7 years. They have poor eyesight and sense their prey through vibrations. The largest species, Theraphosa blondi, which is found in South America, can have fangs 1 inch long and a leg span up to 12 inches. Tarantulas generally can be found in tropical and subtropical areas of the world. The largest tarantulas are found in South America. In the United States, great numbers are found in the southwestern states. Most tarantulas sold in pet stores in the United States are imported species of Aphonopelma. Although tarantulas often evoke panic and anxiety on sight, these hairy long-legged spiders generally are nonaggressive and rarely bite. Tarantulas usually retreat as their main line of defense. If forced to defend itself, the arachnid may flick very fine, fiberglasslike, sharp, barbed hairs from its abdomen at its enemy (shown in the images below). These may stimulate ocular, dermatologic, and respiratory tract irritation. Density of hairs on the abdomen is approximately 10,000 per mm2. 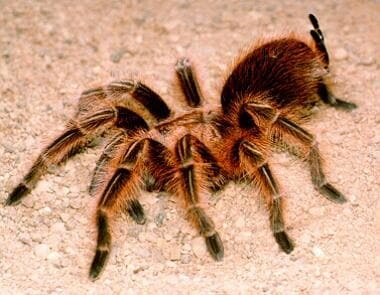 The Chilean rose tarantula. The urticating hairs are clearly visible. Courtesy of Mike Dembinsky. 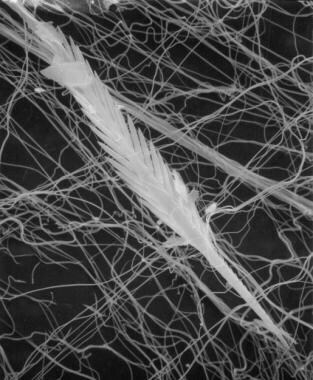 Enlargement of tarantula hairs. Courtesy of Cara Shillington. A tarantula may bite, but first assumes a strike position by raising its front pair of legs and rearing back on its abdomen. Also from the Middle Ages are reports of a dancing mania known as Tanzwuth that was attributed to spider bites. So-called victims would seek out minstrels who would play instruments with shrill tones; this music caused the victims to dance until they fainted. Seizures, demonic possession, and tarantula bites all have been proposed as causes of this behavior. However, no true etiology has been identified, and dancing mania still remains a mystery. Because of the tarantula's forms of defense, human injury is limited mainly to skin and ocular involvement, with occasional respiratory symptoms. Envenomations from the funnel web spider of southern and eastern Australia can be dangerous, even fatal (see Funnel Web Spider Envenomation). Hairs discharged from the tarantula can penetrate several layers of skin or ocular tissue and cause mechanical irritation. Urticating hair morphology ranges from type I to type IV. Only type I hairs are found in US tarantulas, and these do not penetrate the skin as deeply as other types. Type III hairs can penetrate up to 2 mm, causing inflammation and local reaction. Although not common, inhalation of urticating hairs may cause significant allergic rhinitis. Exposure to hairs of certain species in South America (Grammastola) can suffocate small mammals within 2 hours. Approximately 40 species of tarantula live in the United States. The incidence of tarantula-inflicted injuries is not known. More than 1500 species of tarantula live throughout the world. Outside the United States, tarantulas can be found in Mexico, Central America, South America, the Caribbean Islands, Africa, areas of Europe bordering the Mediterranean Sea, and Australia. While all North American species are relatively harmless, a few species in South America, Africa, and Australia may be dangerous to humans (see Funnel Web Spider Envenomation). Experience with ocular injuries is somewhat limited, and more information is necessary for accurate conclusions regarding long-term prognosis. Recovery from eye injuries may be prompt but has been delayed up to 72 months. No cases of infection from tarantula bites or skin exposure to urticarial hairs have been reported; therefore, prophylactic antibiotics are not recommended. As tarantulas become increasingly popular as pets, owners need to be aware of the potential injuries that can occur. Discourage frequent and routine handling of tarantulas. Handlers should wear gloves, avoid tarantula contact with their face and eyes, and wash their hands after working with tarantulas. For patient education resources, see the First Aid and Injuries Center as well as the patient education articles, Black Widow Spider Bite and Brown Recluse Spider Bite. García-Arredondo A, Rodríguez-Rios L, Díaz-Peña LF, Vega-Ángeles R. Pharmacological characterization of venoms from three theraphosid spiders: Poecilotheria regalis, Ceratogyrus darlingi and Brachypelma epicureanum. J Venom Anim Toxins Incl Trop Dis. 2015. 21:15. [Medline]. Corral-Corral I, Corral-Corral C. [Tarantism in Spain in the eighteen century: latrodectism and suggestion]. Rev Neurol. 2016 Oct 16. 63 (8):370-379. [Medline]. Morens DM. Mass fainting at medieval rock concerts. N Engl J Med. 1995 Nov 16. 333(20):1361. [Medline]. Pouraghaei M, Shams Vahdati S, Mashhadi I, Mahmoudieh T. Periumbilical Pain with Radiation to Both Legs Following Tarantula Bite; a Case Report. Emerg (Tehran). 2015 Summer. 3 (3):120-1. [Medline]. Visitsunthorn N, Kijmassuwan T, Visitsunthorn K, Pacharn P, Jirapongsananuruk O. Clinical Characteristics of Allergy to Hymenoptera Stings. Pediatr Emerg Care. 2017 Jun 13. [Medline]. Pałgan K, Bartuzi Z, Chrzaniecka E. ABO blood groups, Rhesus factor, and anaphylactic reactions due to Hymenoptera stings. Ann Agric Environ Med. 2017 Sep 21. 24 (3):428-430. [Medline]. Mangat SS, Newman B. Tarantula hair keratitis. N Z Med J. 2012 Oct 26. 125(1364):107-10. [Medline]. Belyea DA, Tuman DC, Ward TP, Babonis TR. The red eye revisited: ophthalmia nodosa due to tarantula hairs. South Med J. 1998 Jun. 91(6):565-7. [Medline]. Blaikie AJ, Ellis J, Sanders R, MacEwen CJ. Eye disease associated with handling pet tarantulas: three case reports. BMJ. 1997 May 24. 314(7093):1524-5. [Medline]. Sandboe FD. Spider keratouveitis. A Case Report. Acta Ophthalmologica Scandinavica. 2001. 79(5):531-2. [Medline]. Shrum KR, Robertson DM, Baratz KH, et al. Keratitis and retinitis secondary to tarantula hair. Arch Ophthalmol. 1999 Aug. 117(8):1096-7. [Medline]. Waggoner TL, Nishimoto JH, Eng J. Eye injury from tarantula. J Am Optom Assoc. 1997 Mar. 68(3):188-90. [Medline]. Watts P, Mcpherson R, Hawksworth NR. Tarantula keratouveitis. Cornea. 2000 May. 19(3):393-4. [Medline]. Sheth HG, Pacheco P, Sallam A, Lightman S. Pole to pole intraocular transit of tarantula hairs-an intriguing cause of red eye. Case Report Med. 2009. 2009:159097. [Medline]. [Full Text]. Auerbach PS, ed. Spider Bites. Wilderness Medicine: Management of Wilderness and Environmental Emergencies. 5th ed. St. Louis: Mosby-Year Book; 2007. 46. [Full Text]. Slit-lamp photograph showing 2 central infiltrates caused by urticating tarantula hairs (arrows). Courtesy of Southern Medical Journal and David A. Belyea, MD.